THE HEART OF THE Confederate States of America during the Civil War, much of the state of Alabama was originally part of GEORGIA, its eastern neighbor in the south-central UNITED STATES. The British and French fought over the southernmost area until it was ceded to the British in the War of 1812. Scholars disagree on whether the state was named for the Alabama River or the Alibamon Indians who resided in the area during the period of the Creek Confederacy. Alabama is bounded on the east by Georgia and the Chattahoochee River, on the west by MISSISSIPPI, on the north by TENNESSEE, and on the south by FLORIDA and the ATLANTIC OCEAN. 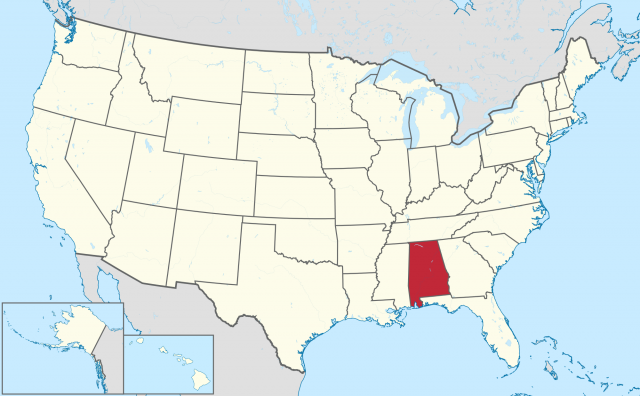 Alabama encompasses 52,423 square mi (135,774 square km), ranking 30th in size among American states. The largest cities are: Birmingham, Montgomery (the capital), Mobile, Huntsville, Tuscaloosa, Dothan, Decatur, Auburn, and Gadsden. Alabama’s major rivers are the Mobile, Tombigbee, Alabama, Tennessee, Chattahoochee, and the Tensaw. The largest lakes in the state are Guntersville, Wilson, Martin, West Point, and Lewis Smith. While the coastal area of Alabama boats a subtropical climate, the climate in most of the state is temperate with average temperature ranges from 91.5 degrees F (33 degrees C) in the summer to 30 degrees F (-1 degree C) in the winter. While rain falls throughout the year, most of the state rarely sees snow. The average rainfall for the state is 53 in (134 cm). The average elevation of the state is 500 ft (152 m) above sea level. The highest point in the state is located at Cheaha Mountain, “high place,” 2,407 ft (734 m) above sea level. The lowest elevation in the state is where the land meets the sea in the Gulf of Mexico. Russell Cave near Bridgeport provided a haven for Native Americans from 6000 B.C.E. to 1650 C.E. The cave, which is now cared for by the National Park Service, provides a first-hand look at the tools, weapons, and the day-to-day lives of Native Americans. Moundville Campgrounds near Tuscaloosa has also preserved vestiges of Native American life. The terrain of Alabama ranges from the coastal plains in the southern part of the state near the Gulf of Mexico to the rugged terrain of the northern section of land where Alabama merges into Tennessee. Alabama is made up of five major land areas: the East Gulf Coastal Plain, which covers roughly two-thirds of the state, excluding the section known as the Black Belt Prairie, where many plantations were located during the antebellum period; the Piedmont Upland found in the central section of Alabama, which is made up of low hills and sandy valleys; the Appalachian Ridge and Valley, which is made up of sandstone ridges and limestone valleys; the Cumberland Plateau, also known as the Appalachian Plateau, which is made up of varying sections of rolling hills and flat areas; and the Highland Rim in the northwest corner of the state, which makes up part of the Tennessee River Valley. The section of the East Gulf Coastal Plain around Mobile, which is the state’s largest seaport, is low and swampy. In the plains of southeastern Alabama, known as the wiregrass section, the soil is the most fertile within the state. Farming flourishes in this section with its fertile soil and easy water access. Waterfalls and caverns are found throughout the mountainous area of north Alabama. Until the beginning of the 21st century when manufacturing, government, and services began to dominate the economy, Alabama’s productivity was largely dependent on farming. Alabama’s economy continues to benefit from the production of farm products that include cotton, peanuts, corn, and hay. Chicken, cattle, dairy products, and hogs provide the majority of the state’s livestock exports. Top manufacturing products include textiles, fabricated metal products, transportation, paper, food, chemicals, plastics and rubber, and wood. Approximately two-thirds of Alabama is forested, and the state is home to more than 125 varieties of trees and more than 150 species of shrubs. Alabama’s trees include pines, oak, hickory, cypress, and southern magnolia. Shrub varieties include rhododendron, mountain laurel, azalea, and sumac. Animals found throughout the state include white-tailed deer, red fox, squirrel, muskrat, nutria, beaver, and rabbit. Game birds include ducks, geese, and quail, while the state’s most common songbirds are the yellowhammer, bluebird, cardinal, blue jay, and mockingbird. Minerals found in the state include coal, iron ore, petroleum, natural gas, limestone, gravel, bauxite, and clay.